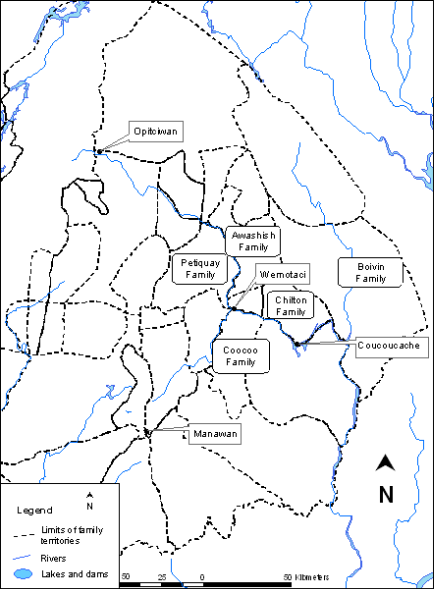 The Atikamekw are a Nation composed of approximately 7,000 people, living primarily in three reserves, namely Wemotaci, Manawan, and Opitciwan. 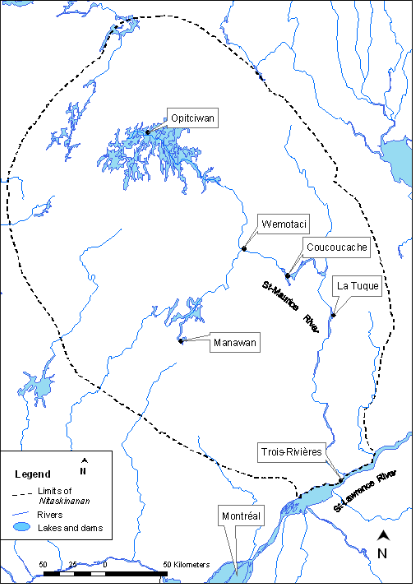 Their ancestral territory, Nitaskinan, is located among the boreal forests and watersheds of the St. Maurice River in northcentral Quebec. The Atikamekw were a hunter-gatherer people and they still regularly practice hunting, gathering, and fishing, even though they have been largely dispossessed from their territory and marginalized by the Canadian State. The Atikamekw have also continued to exercise their customary tenure system, which is based on extended family territories. This has come under threat by administrative delimitations and resource management legislation in Quebec, however, and the province continues to practice logging, lease land for resorts, and control harvesting zones in Nitaskinan. 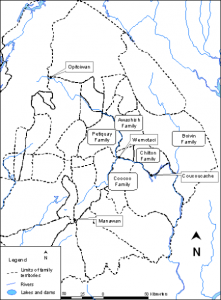 Family territories of customary tenure system. Source: Sylvie Poirier, Christian Coocoo, and Gerald Ottawa – CICADA conference presentation 2015. Boundaries of Nitaskinan. Source: Sylvie Poirier, Christian Coocoo, and Gerald Ottawa – CICADA conference presentation 2015. 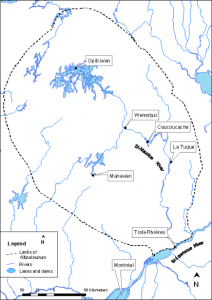 In order to protect their culture, language, and identity, Gerald Ottawa of the Conseil de la Nation Atikamekw explained at the 2015 CICADA conference that the Atikamekw must also protect their territory. 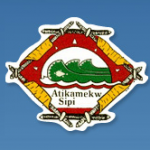 The Atikamekw are currently engaged in struggles at three different levels to gain autonomy and sovereignty. First, they are involved in land claims negotiations with the federal and provincial governments to have their traditional territory recognized. Second, at the regional level, they are attempting to convince municipal governments to reduce leasing their claimed territory to non-indigenous peoples for the use of resorts. And third, in their own communities, the Atikamekw are involved in the social and cultural project of transmitting Atikamekw values and knowledge to the younger generations. They are also working to adapt their customary tenure system to current constraints. 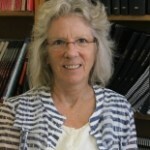 Sylvie Poirier. 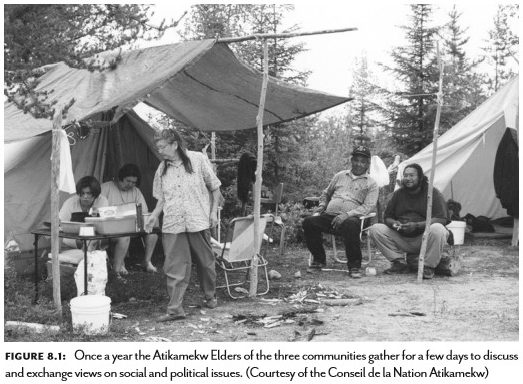 “The Atikamekw: Reflections on their Changing World” in Native Peoples: The Canadian Experience (2013). 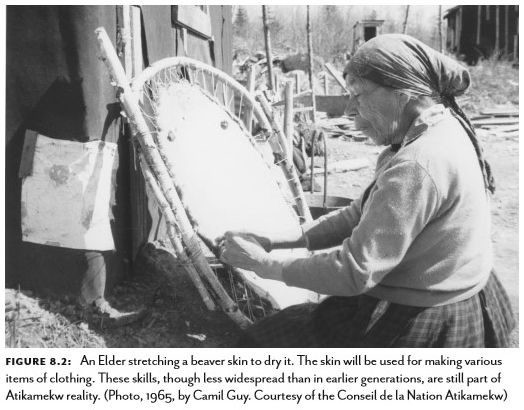 -César Néwashish, a most respected Elder who died in 1994 (age 91). (Source: “The Atikamekw: Reflections on their Changing World” in Native Peoples: The Canadian Experience, 2013). Anthropologist and academic partner Sylvie Poirier works with the Atikamekw, exploring notions of territoriality and knowledge. Poirier seeks to understand how these concepts impact the land claims process in which the Atikamekw are currently engaged with the federal government in order to have rights on their own territory. 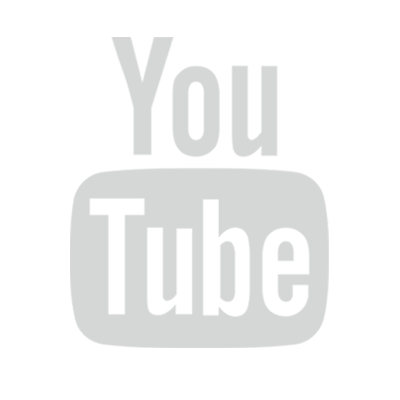 In particular, Poirier has studied the Atikamekw Kinokewin project, whose aim is to facilitate the intergenerational transmission of Atikamekw knowledge. Christian Coocoo of the Conseil de la Nation Atikamekw identified three challenges to the transmission of knowledge: 1) the creation of reserves; 2) residential schools; and 3) young people’s penchant for social media.